Stereo World, Vol. 41, No. 1, March - April 1977, pp. 4-5. Copyright © 1977 by the National Stereoscopic Association, Inc.
One of San Francisco's best known photographers of the past century was Carleton E. Watkins, who gained world fame in the 1860's for his views of the Yosemite Valley. Bringing rich and rare sights to a worldwide audience, Watkins employed a dozen mules to carry cameras, chemicals, glass plates, a tent for a darkroom and various other equipment through the scenic but dangerous Yosemite. His efforts in Yosemite produced countless photographs, including about two thousand stereo views. In 1870 the European Art Journal exclaimed that it was "no small satisfaction to credit an American artist for the great Yosemite Pictures." Watkins was also hailed on the East Coast for capturing the "attitudes of nature." In 1868 he was awarded first place for California landscape photography at the Paris International Exposition. Five years earlier William Alexander, an Hawaiian historian, visited Yosemite and recorded the following experience: "On the table in our sitting room (there was) a large stereoscopic box, so arranged that by turning a crank on the side one picture after another is brought into focus. It contained over 70 large stereoscopic pictures by Watkins, mostly of the Yo Semite valley scenery, far superior to any pictures of the kind that I have seen." Such remarks clearly show how Watkins had become one of the most respected photographers of his day. THE COVER: "Primitive Mining, The Old Rocker" No. 3542 by C. E. Watkins from the "New Series". Staring out at us from our cover is C. E. Watkins, in this self-portrait which was made for his children. [Reproduced on this web page is] Eric Hill's article on one of San Francisco's best known photographers. (Collection of The Society of California Pioneers). One of Watkins' most interesting achievements was his special sized stereo camera which would handle a plate 5 1/2 " x 14". With each exposure he produced two negatives 5 1/2 " x 7", from which he could print any sections he wished, sometimes making two or three different stereo pairs from a single plate. With his success from the Yosemite works, Watkins soon opened his own Yosemite Art Gallery on Montgomery Street in San Francisco, which would now be in the heart of the city's financial district. Though he billed himself as a "portrait and landscape" artist, he took very little interest in portraits, while he lined the walls of his gallery with landscapes and offered his stereo views for $1.50 per dozen. His prices were average and his quality superb, but Watkins took more interest in photographs than business, and in the 1870's his gallery was taken by creditors. He was always paid well for his work, but his subordination of business to the art of photography can be seen throughout his career. He came to California's gold rush with his boyhood friend Collis P. Huntington, who later gained fame as one of the "Big Four" of the Central Pacific Railroad. While neither succeeded in the gold fields, Watkins held a job in the early 1850's as a store clerk in San Francisco. His congenial personality with customers drew the attention of R. H. Vance, a well-known Daguerreotypist who had studios in San Francisco, Sacramento and San Jose. When his San Jose operator left his job unexpectedly, Vance quickly summoned Watkins to look after the studio – just until he could find another replacement. Since Watkins knew nothing at all about the medium, Vance showed him the primary elements and planned that Watkins would more or less act out the motions of picture taking. Vance would come to San Jose later to apologize to the customers for an unexplained malfunction and then retake the portraits himself. But Watkins' interest excelled, and he quickly taught himself the technical points. When Vance returned, he found that Watkins had not only taken several portraits, but that the customers were thoroughly satisfied. His photographic interest soon led him to independent projects in the neighboring area. 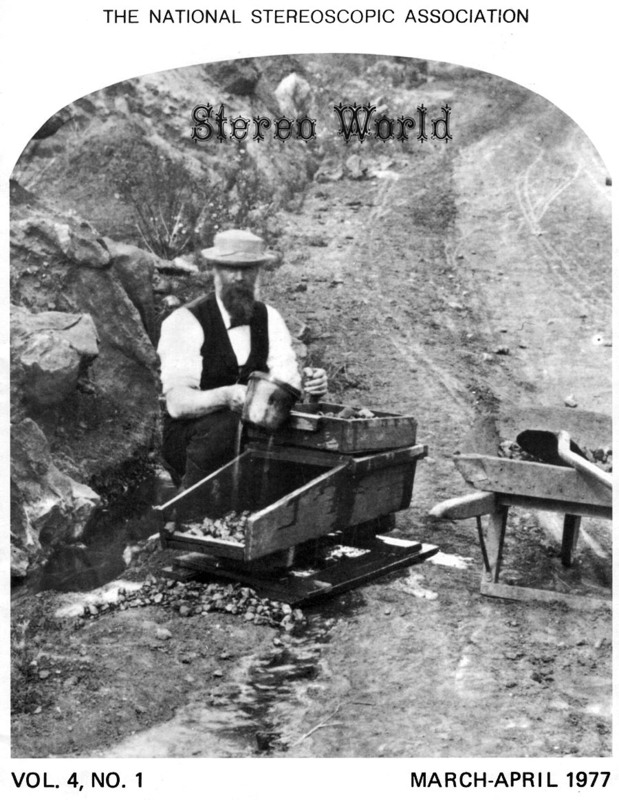 San Jose was a major supplier of the mercury used in the processing of gold, and at the nearby "Almaden Quicksilver Mines" Watkins made several Daguerreotype stereo views. This gained a good deal of attention due to a widely publicized law suit concerning the ownership of the mines, and the sale of these pictures seem to be the incentive to further his career. "British Steam Frigate Zealous", No. 1360 by C. E. Watkins. This view was taken from one of Watkins' favorite spots, looking down upon San Francisco Bay from atop one of the cities' numerous hills. (John Waldsmith Collection). In 1857 or 58 Watkins returned to San Francisco, and in 1861 he made his first trip to Yosemite. Following the success and subsequent loss of his Yosemite Art Gallery, Watkins found that I. W. Taber, the new owner, was plagiarizing his pictures which were lost with the business. But in the 19th century, there were no copyright laws covering photographs, so without legal recourse, Watkins attempted to retake several of his old views and simply warn the public of the bogus works on the market. He also began recording the new pictures as his "New Series," distinguishing them from the "Old Series" which preceded the loss of his gallery. He even opened a new studio, but was still never able to regain the prestige from those initial works of Yosemite. But with Huntington, John Muir, the painter William Keith and others, Watkins' circle of friends numbered among society's upper class, and he was always respected for his ability and never without work. In 1880 Watkins married Frances Sneed, whom he met while photographing Virginia City. The couple had two children, Collis and Julia. His wife took an active part in the business, including full responsibility when Watkins made photographing journeys. Throughout his career, Watkins photographed a good deal of the Pacific Coast area, including Yellowstone to the north and Tucson, Arizona to the south. He photographed all of California's missions. And when Huntington found success in the railroad, Watkins was supplied with occasional employment and never ending free transportation. His last job was' photographing the hacienda of Phoebe Apperson Hearst near Pleasanton. He never finished this work due to his failing eyesight which drew an end to his career. "Lick House Dining-room, S.F. ", No. 1745 by C. E. Watkins. Between the arches along the wall are Thomas Hill's paintings of California's scenic areas. (John Waldsmith Collection). In these later years, Watkins's health became poor and his financial problems were paramount. Huntington died in 1900. By 1906 Watkins' good friend, Charles Turrill, decided to organize his works and lend aid for a commercial venture. When the earthquake struck, some of Watkins' works were at Turrill's home, but the greater portion were at Watkins' Market Street studio, which was completely destroyed by the fire. Lost were countless pictures and negatives, including the bulk of his stereo works. Watkins then retired to his small ranch in Yolo County, deeded to him by Huntington's Southern Pacific Railroad for past services. But he never recovered from the shock of losing his life's works, and in 1910 he was moved to Napa State Hospital for the insane, where he died at the age of 87. 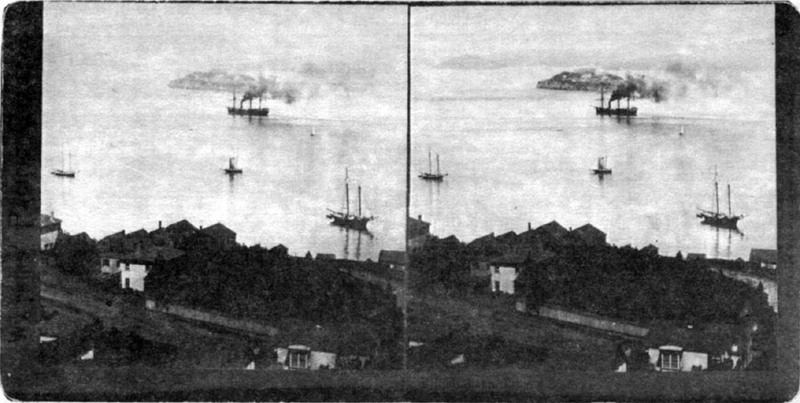 Watkins stereo views are now rare. Nearly all of the works left with us today are those saved by Turrill. Perhaps the most valuable are 75 glass stereos from the first Yosemite trip. But one of the most interesting is the stereo view of Watkins himself. It is cropped from one of his typical 5 1/2" x 14" negative plates. In this self portrait, which is one of the few pictures he ever allowed of himself, he is found portraying a miner using a rocker. Several years later his daughter, Julia, recalled that the picture was made only for his children. "Did you ever see a miner with a white shirt?" she remarked. Such a picture supports his daughter's claim that Watkins was a friendly character, always full of fun and happiness. This causes us to wonder: Though his photographs were made with superb quality of composition and printing, perhaps his ability to get along with people was the real trademark of his career. Courtesy of the National Stereoscopic Association, Mary Ann Sell, President, and Don Gibbs, Manager, Stereo World back issues. Reproduced by permission. "Photographer Carleton Watkins has been the subject of several major museum exhibitions, including those recently at the National Gallery of Art, and the San Francisco Museum of Modern Art. Born in 1829, Watkins' career spanned more than fifty years, and his travels covered thousands of miles: from British Columbia in the north to the Mexican border on the south; westward to the Farallon Islands off San Francisco and eastward as far as Yellowstone. The radical way Watkins viewed the landscape derives in part from his lifelong association with the railroad; the towns and industries that arose in the West along its right-of-way became a persistent subject in his later career. The railroad made a new kind of landscape as it penetrated the continent, and Watkins aligned his photography with the changing perceptions the train brought about. At twenty-one, Watkins left New York and headed out to California to make his fortune. After working as a daguerreotype operator in San Jose, he established his own practice and soon made his first visit to the Yosemite Valley. There he made thirty mammoth plate and one hundred stereograph views that were among the first photographs of Yosemite seen in the East. Partly on the strength of Watkins's photographs, President Abraham Lincoln signed the 1864 bill that declared the valley inviolable, thus paving the way for the National Parks system. Stereo views were, with the exception of photography itself, the most important and popular visual technology of the 19th century. By the 1860s, stereo views had become the television of their day-a widespread, inexpensive and mass-marketed form of home entertainment, with a stereo viewer and basket of cards in every proper Victorian parlor. Watkins made more images in stereo than in any other format, inventing imagery that made spectacular use of its three-dimensional effects. Watkins' fortunes went through many states of flux. At times he was hailed as one of the greatest photographers of his time, at other times he was bankrupt and penniless, relying on friends and associates for assistance. Towards the end of his life Watkins eyesight had faded badly and, by 1897, was relying on his assistant Turrill and his son, Collis, for help. In 1906, there was a great earthquake and fire in San Francisco, in which Watkins lost all his remaining work. Three years later, Watkins was declared incompetent and the next year was committed to Napa State Hospital for the Insane. Watkins died in the mental hospital in 1916 and was buried in an unmarked grave in its grounds." Summarized by an anonymous contributor from published web biographies including those cited below.